What Makes the Perfect Ski Holiday? It May Not be Powder! Anyone who is afflicted by what I like to call “the equine obsession” will know all too well the realities of mud. Whether brushing it off, barrowing it or wading through it, or, very often in my case, standing yet again in a field of it watching a son disappear off on the gallops while being battered by horizontal rain driven at me by gale force winds … being so afflicted I do love it. Mud comes with one kind of winter, but bring this obsession in alignment with another winter sporting passion and life couldn’t become more complete. And so to St Moritz. In a complete reversal of the mud-churned fields of home I’m transported to the snow and sun paradise of the Engadin, much as the first British tourists were 153 winters earlier when they made the first-ever recorded ski holiday in the very hotel I’m booked into: The Kulm. In their case they were escaping the London fog for the champagne climate of the high Swiss Alps although I’m sure there were many horses on the London streets back then. It is February, -20°C, and my nostrils are frozen, but the sun is out, the sky achingly blue and it’s time for horse-related ski fun. The first activity, the phenomenon that is ski-joring – which means, essentially, being towed behind a horse on startlingly bright snow. We’ve been whisked up to the frozen Lake Silsersee, reputedly the region’s most beautiful. It is indeed a scene from the Hollywood dream image on a winter holiday scene. Families are walking happily through the snow, some fit-looking folk are cross-country skiing, others sledging on the banks and there are small cafés selling hot chocolate. The scene is completed by two excited-looking horses which come trotting around a corner, ready to tow us away. As I greet the riders I realise I am missing my own beasts too much and bury my hands into their shaggy necks, breathing in deeply that horsey smell. My surprise is that instead of the stocky Haflinger breed work horse that is popular in the Alps, we have a chestnut Arab, the horse of the desert, and a stunning black Friesian (there’s a certain bank advert …). Lupo, who is in charge of the ski-joring operation in St Moritz, explains that the activity began in the area as a way for more genteel ladies to go shopping in winter, carrying their purchases back on their pony while they were towed behind. I don’t think any shopping is planned today though. But before I can start interrogating the riders with boring horse talk they turn, ropes attached to the pommel and placed with a triangle of rope and wooden handle laid out behind. It’s clear we have to pick it up and go for a tow. This is the nerve-wracking element. My entire instinct is to leave the back end of a horse well alone, not be towed right behind it, particularly when the beast’s ears are flicking, there’s a little prancing going on and snorts of excitement are being made. However, not one to duck a challenge, I pick up the rope and brace myself. We go sedately at first. There are a few ruts and bumps to bounce over but we’re on a beautifully groomed path across the lake. There’s even time to take in the scenery and smile over at the folk pointing and waving at the sight of us. Try a trot? Why not! A little speedy jerk forward and the pace increases, as does my competitive edge – bend knees low, start watching for corners to maximise speed, it’s getting more exciting. A canter? Too right … and don’t let the horse behind catch us up! Snow sprays in your face (yes, you need goggles) and my hands are painfully frozen, but the exhilaration is intense and I want to go faster than any other “ski-jorer” in our team, nerves a distant memory. But too soon it’s over. The horses have behaved impeccably, and despite the -20°C temperatures they need to cool down so depart for a well-earned rest and rug. As the adrenaline surge subsides I realise my hands hurt like hell and I need to be holding a hot drink. 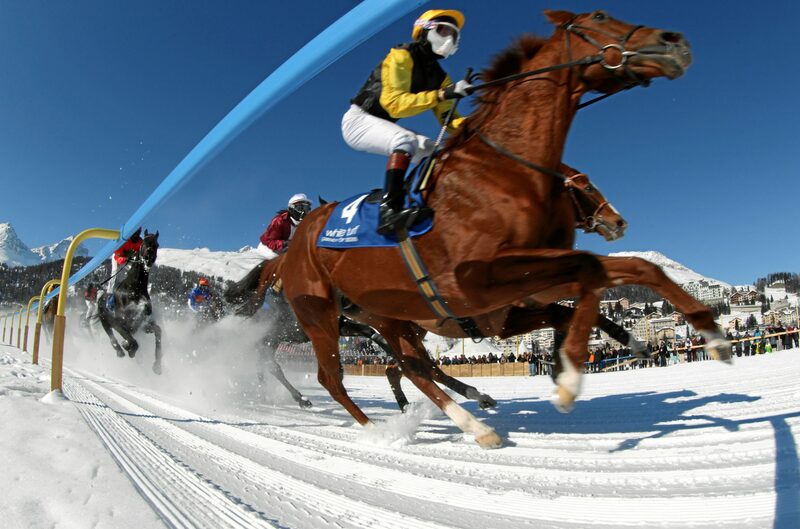 Lupo, meanwhile, is preparing for a more serious ski-joring event, none other than the famous White Turf racing meet, which takes place on three successive Saturdays in February on the frozen Lake St Moritz, combining classic horse racing in snow with ski-joring competitions. Next day I lay in my comfortable bed thinking, “Is there a better place than St Moritz to wake up?” The heavy curtains of the fabulously opulent Kulm hotel have blocked out the bright sunshine, but I can feel the tang of winter in my nostrils, and no matter how cold it is I will always sleep with window open. It takes me a while to burrow out of my luxurious duvet/pillow nest, and I peep through the curtain. It’s race day. The event, like a white witches’ jousting tournament, is a feast for my acclimatising eyes, spread below on the ice field that is the lake. Opposite I can see the Corvatsch ski area. St Moritz is awake. Race horses need to be tended to, catering organised, champagne chilled and I’m sure I have a day in the splendid Kulm spa with an excellent masseur to soothe those ski-joring muscles. A perfect start to race day. I enter the St Moritz arena with friends, and we walk tiptoe past the beyond-luxury cars and lifestyle tents, but then I realise I am strolling through a wide range of race goers. Fur still has a strong hold, as do gold ski suits and the type of sunglasses that Sir Elton would covet. Yet the wonderful thing about horse racing is the one reason we are all here – the spectacle of the race. I get a little giddy with excitement, and I’ve not even seen the track, spotted a pony or knocked back a double espresso. There are trotting races as well as ski-joring and flat. Trotters are an interesting idea with very fine, almost wire-like gigs on thin runners where the jockey is only allowed to let the horse trot – break in to canter and the race is lost. Lupo, our ski-joring friend from the previous day, has his race. I am disloyal and bet on the horse he said would win. I recognise its breeding, and as it parades up to the starter I know it’s a class apart. At the halfway stage it’s being held and seems to be enjoying the canter before it’s given the OK to take off, which it duly does, winning by at least 10 lengths. Lupo finishes respectably behind. Ski-joring racing is an impressive, no-holds-barred affair. Trying to gain a corner as you’re being sling-shot outwards and avoiding a horse coming up by your side at nearly 50kph is not easy and not for the faint-hearted. I think I’ll keep my snow and horse racing sports separate. What else to say about my trip? There was more to it than just the equine experience, although that remains the main attraction for me. I skied the beautiful slopes of St Moritz, of course, always wonderful in the morning when it is unfashionable for the resort’s beautiful people to be out on the snow. They tick all the boxes – a great range of terrain, spectacular views, great snow at this high altitude and some wonderful mountain huts in which to take a break. As mentioned, I stayed in the incredible Kulm hotel, which was where the very first recorded winter sports holiday took place back in 1864, beginning now more than 150 years of an exceptional skiing history, including essentially hosting the second Winter Olympics here in 1928 almost on its own, and being the meeting place at the start of the world-famous Cresta run. The hotel has grown into a spacious 5★ with several gourmet restaurants and an incredible spa, but the original simple house where those first guests were received is incorporated into its fabric, and the Ice Pavilion, built in 1905 and where skating competitions were staged at the 1928 and 1948 Winter Olympic Games, has recently been restored and converted into a wonderful restaurant, designed by the great architect Norman Foster. 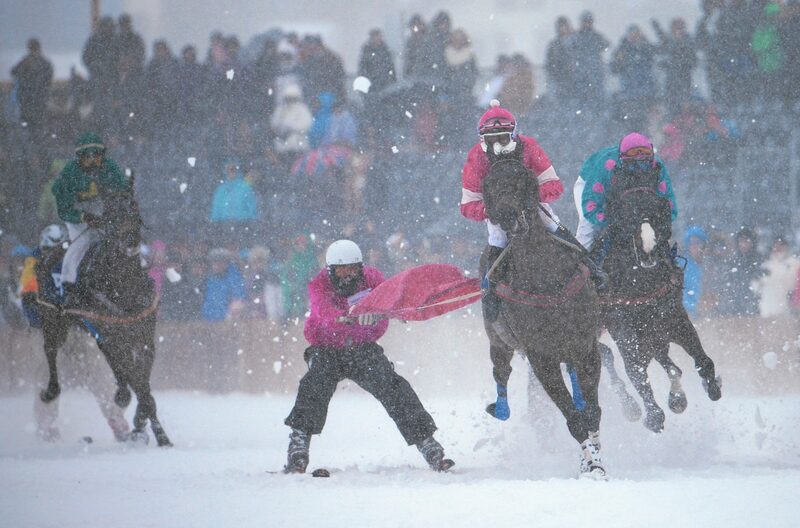 In short, if you’re going to go skiing with horses, there are few better choices than St Moritz. 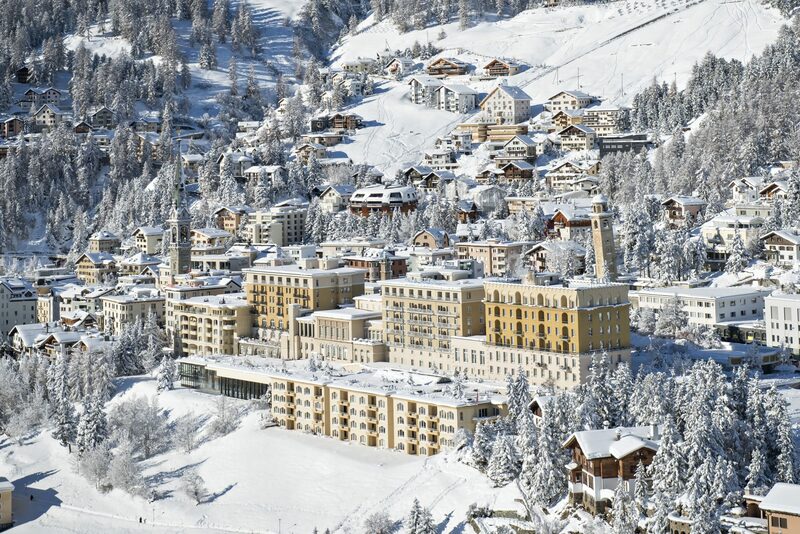 The Kulm Hotel St. Moritz is open this coming winter from 6 December 2018 to 4 April 2019, starting from CHF675 (around £535) for two people sharing a double room on a half-board basis. Kulm Benefits include: Guests are entitled to a discounted daily ski pass costing CHF38 (around £30); a gourmet “dine around” package allowing guests to eat in one of 17 restaurants; early bird skiing sessions every Wednesday morning, when only hotel guests get to ski for an hour before the official opening of the slopes; free skiing and snowboarding lessons for kids aged 3 to 12 years.